Get Your Passport to Adventure! | Sumter…In the Middle of Everything! Looking for things to do in Sumter just got a lot easier! 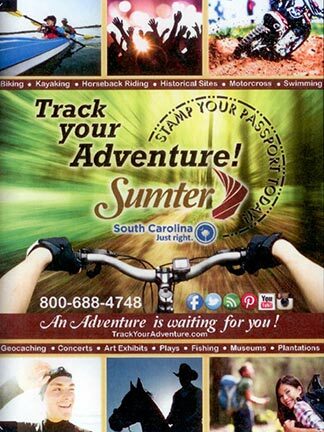 The Sumter Convention & Visitors Bureau has worked in collaboration with 22 area attractions to produce a new initiative, “Track Your Adventure,” a campaign that has already begun attracting hundreds of local residents to find fun and excitement in our hometown. Planned as a marketing strategy to attract visitors from across the southeastern US, “Track Your Adventure” features both such well-known destinations as Swan Lake Iris Gardens, and those somewhat off the beaten path, like the LeNoir Store and Willard Farms, among many others. Participants are issued a “passport” to be stamped as they visit each location. The first 1,000 people to return a completed passport to the Swan Lake Visitors Center will receive a prize. Visitors are also encouraged to post photos of their outings to our social media pages. More information can be found online at TrackYourAdventure.com. Of course, we can’t make it quite that easy. Not only are some of the locations not particularly well-known (although we are hoping to change that! ), not all of them are open daily or year-round. So, if you choose to take on the adventure, prepare for a challenge. Twenty-two places to visit…one place to have your completed passport redeemed. Over the coming weeks, we will feature information about many of Sumter’s best kept secrets. Until then…get ready to track your adventure! 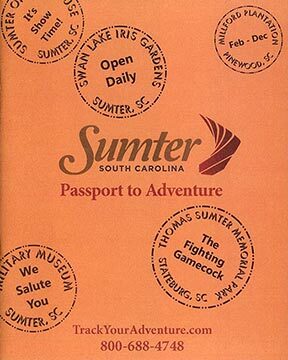 This entry was posted in Sumter SC Tourism, Sumter, South Carolina, Visit Sumter SC and tagged Aquatics Center, arts, athletics, baseball, birdwatching, Boykin, Carolina Bays, community theatre, Crystal Lakes Golf Course, Dillon Park, Downtown Sumter, fishing, gallery, gardens, General Thomas Sumter, history, Horatio, hunting, LeNoir Store, Manchester State Forest, Milford Plantation, Military Museum, museum, outdoor recreation, Pack's Landing, Palmetto Tennis Center, Patriot Hall, performing arts, Poinsett State Park, racing, Riley Park, SC, SC Palmetto Trail, Skate Sumter, soccer, softball, South Carolina, sports, stage plays, Sumter, Sumter County, Sumter County Gallery of Art, Sumter County Museum, Sumter Little Theatre, Sumter Opera House, Sumter Speedway, Sumter Spray Parks, Sumter Trolley Tours, Swan Lake, Swan Lake Visitors Center, swans, Tennis, The Broom Place, Thomas Sumter Memorial Park, tours, Track Your Adventure, trails, war heroes, Willard Farms, Woods Bay. Bookmark the permalink.